Stanfield Shutter is Utah's premier interior shutter manufacturer, serving Utah for over 70 years with integrity, quality products, and superb service.
. Using the traditional 1" shutters. Paul built his business with quality craftsmanship and attention to detail. In 1973 Gary Stillman, answering an ad in the newspaper, was interviewed, hired and worked as Paul Stanfield's general manager. Gary enjoyed so much working and learning from Paul Stanfield that Paul and Gary came to an agreement for Gary to purchase Stanfield Shutter Company in 1975. 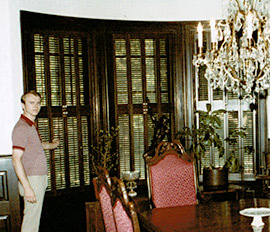 With his excitement and dedication to Stanfield Shutter Company, Gary worked with home contractors, interior designers and home owners to grow Stanfield Shutter into a household name known for quality, reliability, reputation and customer satisfaction. Even though the 1" traditional shutters used in Paul Stanfield's day have gone by the wayside and have evolved into the larger 'Plantation' Shutters we all know and love today. The dedication to quality, reliability, reputation and customer satisfaction that Paul Stanfield and Gary Stillman have lived up to, remain the foundation of Stanfield Shutter Company today. We continue to dedicate our work to the tradition of quality and craftsmanship that Paul Stanfield Started over 70 Years ago and that Gary Stillman continues to instill into what he considers his family of the company today. 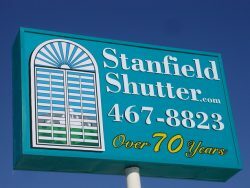 Gary and Paul came into an agreement for Gary to purchase Stanfield Shutter. Today we remain dedicated to quality, reliability, reputation & customer satisfaction. For over 70 years Stanfield Shutter has continued that dedication of quality craftsmanship and attention to detail. 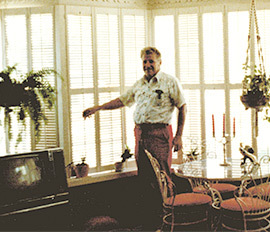 For years our happy satisfied customers have continued to purchase Stanfield Shutters. Those that purchased shutters when Paul Stanfield owned the company have recommended there children to Stanfield Shutter Company and then those children have recommend there children. From generation to generation and from decade to decade Stanfield Shutter has continued the commitment of manufacturing fine quality shutter products for our customers, for which we consider them to be our friends and family. Stanfield Shutter continues to be on the on the leading edge of the technological advancements in shutter manufacturing today and the leader in custom plantation shutters design along the Wasatch Front. We look forward to our association together.